For use after illness such as colds and flu, and when you are feeling tired and run down. 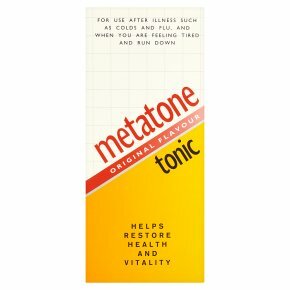 Helps restore health and vitality.Metatone provides a combination of Vitamin B1 and four essential minerals in a liquid formula, which help provide a gentle boost when you are feeling tired or during and after illness. Dosage: Adults and children over 12 years; One or two 5 ml spoonfuls, two or three times daily before meals (dilute if required). Children 6-12 years; One 5 ml spoonful, two or three times daily before meals (dilute if required). Always read the leaflet. Do not use if bottle seal is broken when purchased.<br>Please consult your pharmacist or doctor if symptoms persist.